Tax Justice Network: Does Costa Rica gain full benefit from its pineapple trade? Does Costa Rica gain full benefit from its pineapple trade? The Guardian's Felicity Lawrence recently filed an excellent article on global pineapple trade. Taking the example of Costa Rica, she outlined the low wages and union busting, the environmental harm caused by excessive use of agro-chemicals, and the injuries and health problems incurred by workers. The article has touched several raw nerves, and much of the industry response has focussed on the "economic" benefit to Costa Rica. Employment creation is one, but this can be limited to low wage employment with little in the way of useful knowledge transfer. Local procurement of inputs is another potential area of benefit, but chemical inputs are largely imported so the links to the domestic economy are limited. And then there's the issue of tax on profits generated. If the taxable profits are retained and taxed locally there might be a genuine benefit to Costa Rica. But that's a big if: profits generated by multinational companies are easily shifted offshore, and these leakages make it very hard for tax authorities in countries like Costa Rica to determine what taxes are due. 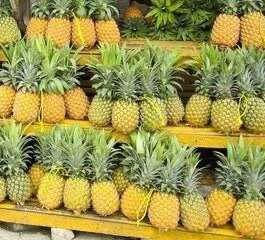 If you look at the export prices for pineapples per kilo, you can immediately see that pineapples leave Costa Rica at an average of 40 cents per kilo. Exports from other producing countries, which all happen to be developing countries, show similar average prices. By the time shipments of pineapples come to be logged in the main importing countries for Europe of Belgium, Holland and Germany, however, the price has doubled to more to 83 cents per kilo in Belgium, and up to $1.14 in the Netherlands. So where's the money going between pineapples leaving Costa Rica and arriving in Europe? The most obvious answer is that the profits are being made offshore as pineapples pass through subsidiaries of transnational companies where charges can quite legally be added on paper for "services" such as use of brand names, or expertise in markerting and logistics. We've seen something similar in the past. In November 2007 Felicity Lawrence and Ian Griffiths published an article about how bananas are traded through offshore structures to shift profits to tax havens. You can find the results of their astonishing research here. Approximately half of the retail price paid for bananas consumed in Europe is accounted from by dubious transfer pricing of intellectual property rights, including brand names, use of distribution networks, financial services, marketing services, insurance services, and so on. In every case, these services were provided by subsidiary companies registered in tax havens. The banana case study revealed a massive faultline in globalised trade: intellectual property rights are hard to price and therefore provide perfect cover for multinational companies to shift their profits to a zero tax jurisdiction. On the basis of the available trade data, Alex has estimated the potential profits-shifting on pineapple trade from Costa Rica in 2009 at approximately US$590 million. If this is the case, the claims made about benefits to the Costa Rican economy are exaggerated. As Felicity notes: "We'd love to hear from the industry on this..."